For the sake of clarity, we define portable tools as including both corded and cordless drills, saws, and other hand held implements of dust making. This is opposed to large power tools such as a table saw or jointer. That said, there are a wide range of options when dealing with any of the tool categories available today. For beginners, there are two portable tools that will immediately prove useful and versatile enough to validate their purchase. First up is a cordless drill. We happen to have a DeWalt with 12-volt battery system. Ours is a typical piece that came with one battery, a charger, and carrying/storage case. If you plan on working for hours at a stretch, a second battery is a good investment. That way you can have one on charge and the other in the drill. Most cordless drills have a keyless chuck and two-speed drive unit allowing you to drill clean holes with ease. The slower speed is great when driving screws. A reverse-mode switch should be located right near the trigger where you can reach it with minimal effort. A clutch control is essential for driving screws. Only your experience can tell you what setting is right for a given job, but that won't take long. If you are stripping the heads or driving too deep, reduce the clutch number. If the heads are not fully seated before the clutch engages, increase the number. Face it, we're not talking rocket science. And different screws require slightly different technique. Be patient, you'll get the hang of it. 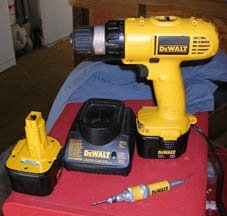 For accessories, buy an extra battery (have one on charge while using the other), a set of brad-point drill bits, and a quick-change countersink. Expect to be out around $140 when you're done. But this tool will get a lot of use and pay for itself many times over. Next up: Circular saw. Get one with a cord. Most circular saws will be of the 7 1/4-inch blade size. These can be intimidating machines and are dangerous to the complacent operator. Only move forward with a cut, never back out with the blade turning. All circular saws will have a small flat platform that can be adjusted for different depths and angle of cut, a blade guard that rotates into and out of a safety position, and a trigger switch. Fairly straightforward. 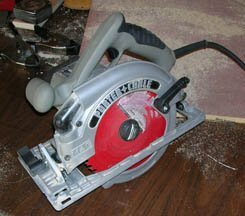 A circular saw is meant to cut large pieces into small ones along straight lines. Some travel can be expected, even with a nice scribed line on the board. But there some simple jigs you can build that will assist you in cutting a straighter line. Don't run over the cord. Don't let the startup torque catch you off guard. Don't get so comfortable that you let this thing get you. As with any power tool, it bites wood hard and fingers harder. For accessories, get a sturdy extension chord and extra blade. Expect to spend around $150. These two tools will be plenty to get you started woodworking. You have to spend a few dollars, but a good cordless drill and circular saw will be with you a long time and serve you well.